Angiolo Mazzoni was a prolific state architect and engineer of the Italian Fascist government of the 1920s and 1930s. 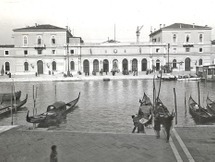 He designed hundreds of public buildings, post offices and train stations during the Interwar period in Italy. He was born in Bologna, later moved to Rome with his parents and returned to the Academy of Fine Arts, Bologna for his education. 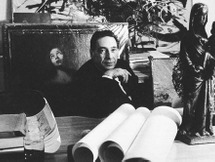 In 1920 Mazzoni practiced for about a year under Marcello Piacentini. The following year he was engaged as an engineer with the Special Section of Railway Workers in Milan, then rose to a position in the newly formed Ministry of Communications in 1924, producing significant independent work by 1926. Politically astute, Mazzoni also joined the National Fascist Party in 1926. He owed much of his success and influence to his intimate connections with the Fascist regime, and played a decisive role in using architecture to consolidate positive images of Fascism. The Fascist regime engaged in a comprehensive national program of public works. As chief architect for the Ministry of Communications and for the State Railways, both key modernizing sectors of Fascist rebuilding programs, Mazzoni designed many of them. Italy still contains hundreds of his large and small railway and telecommunications buildings, extant and functioning, a tribute to his mastery of robust, hard-working construction. In many of these he collaborated with architect and engineer Roberto Narducci. 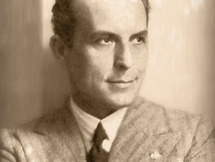 Mazzoni's relationship with Fascism made it politically difficult for subsequent scholars to acknowledge his importance. Construction on his major commission, the vast Roma Termini railway station, was suspended in wartime Italy and redesigned by others after the Fascist defeat. Other important buildings by Mazzoni were crudely altered or demolished in the post-war period. His own personal advocacy of Fascism worked against his legacy, even after the end of World War II when he voluntarily exiled himself in Bogota, Colombia until 1963. Mazzoni's early works shows connections to the Viennese School of Josef Hoffman and Otto Wagner, with a neo-classical influence. Stylistically eclectic, Mazzoni joined in 1933 to the so-called "second phase" of the Italian artistic movement Futurism, signing in 1934 the Manifesto of Aerial Architecture with F.T. Marinetti and the journalist Mino Somenzi, architectural evolution of the futurist aeropittura. Throughout his work, his stylistic approach varied dramatically, from the overtly bombastic and classical to the dynamically modern. In every case, his handling of composition, solids and voids, light and shade, surfaces and materials, was originally conceived, spirited, poetic, erudite, strong, and full of conviction.